The environmental benefits of SIGNATURE PACK from SIG have been confirmed by a critically reviewed ISO-conformant lifecycle assessment (LCA) – the world’s first for a mass balance product. The SIGNATURE PACK from SIG is the world’s first aseptic carton pack linked to 100 % plant-based renewable materials. The LCA showed significant reductions in environmental impacts across all 10 categories as a result of the substitution of fossil-based polymers with mass balance plant-based polymers made from tall oil (a by-product of paper manufacturing). 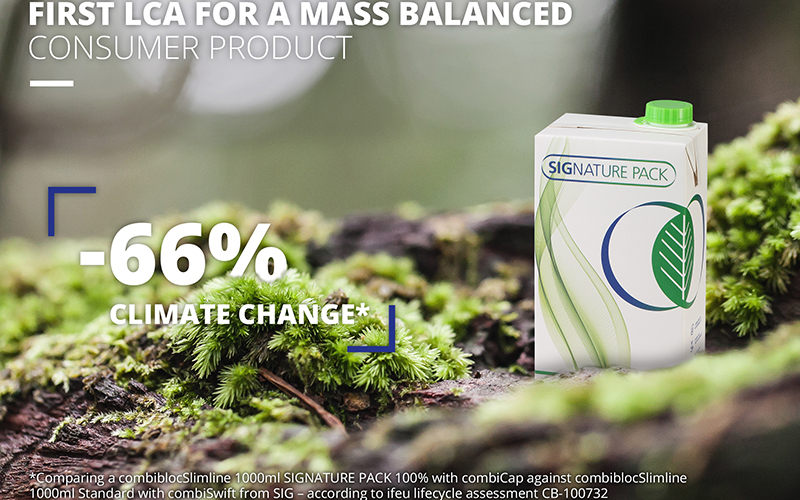 The carbon footprint of SIGNATURE PACK is – on average across Europe – 66 % lower than the carbon footprint of a standard SIG 1-litre carton pack of the same format across its lifecycle, based on the Europe-wide LCA. The polymers in SIGNATURE PACK are 100 % linked to plant-based material via a mass balance system, whereby plant-based raw materials are mixed in with conventional fossil raw materials to produce the polymers. The amount of plant-based material included in the mix is equivalent to the amount needed for the polymers used in SIGNATURE PACK and the totals are balanced through recognised and audited certification schemes to ensure strict traceability and accountability. The SIGNATURE PACK LCA is the first ISO-conformant LCA to take into account the inclusion of materials via a mass balance system. LCAs are traditionally based on the physical contents of a product and the environmental impacts associated with each stage of its production. The independent, critically reviewed LCA of SIGNATURE PACK was conducted in accordance with recognised international standards, ISO 14040 and ISO 14044 by the Institut für Energie und Umweltforschung (IFEU/Institute for Energy and Environmental Research) in Germany. IFEU agreed to conduct the LCA when it became clear how valuable SIG’s mass balance approach could be in making mainstream polymer production more sustainable. SIG chose a mass balance approach because it supports a wider transition from fossil to bio-based raw materials within the conventional and highly efficient polymer industry, instead of using niche small scale producers with a limited number of plastic grades. The polymers are supplied by plastic producers, Sabic and BASF, using plant-based renewable material from European wood sources. Tall oil was selected as the feedstock because, as a by-product of paper production, it is a waste material rather than an agricultural crop that requires land and resources to grow.